Microsoft has had a very bad streak in regards to updates for the company's flagship products Windows 10 and Microsoft Office. 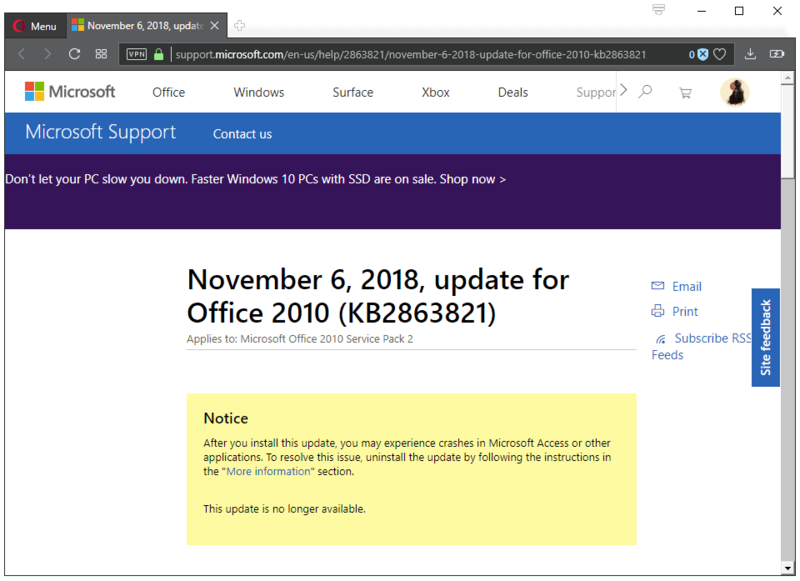 After the October 2018 Update fiasco -- the company had to pull the feature update days after release and re-released after six weeks of silence again -- it is now Office that is plagued by updates that cause issues when they are installed. Microsoft released non-security updates for Microsoft Office 2010, 2013 and 2016 on the first Tuesday of the month (November 2018). We covered the release as we always do, and noticed that some of the released updates were pulled by Microsoft. If you check KB4461522 and KB2863821 for Microsoft Office 2010 on the Microsoft Support site, you will notice that Microsoft pulled these updates and recommends that administrators remove the updates if already installed from Windows systems. Microsoft explains that the update may cause crashes in Microsoft Access or other (Office) applications. Instructions to remove the updates if installed are provided on the support pages; basically, what you need to do is open the list of installed updates on the Windows PC, find the two patches that Microsoft suggests to remove to uninstall them. The issue is not the only one that may affect Office 2010 installations. Microsoft published a support article on the Office website that highlights a crash in Outlook 2010 after installing the security update KB4461529 for Outlook 2010 which the company released on November 13, 2010 on Patch Tuesday. The update fixes four security vulnerabilities, all rated with the severity level of important, in Outlook 2010. The issue itself affects 64-bit installations of Outlook 2010 only. The issue is under investigation currently; Microsoft does not recommend that the update is removed from affected systems and suggests that users use Outlook Web Access instead as a workaround until the issue is resolved. Microsoft revealed recently that update quality was better than ever for the Windows 10 operating system. Previous Post: « Is Microsoft making an effort to improve update transparency and quality? Never had any problems with it. It’s one of those programs which really doesn’t need constant updates. Unless you’re one of those people who gets tricked into clicking on “Songname.mp3.exe” files. How to completely mess up your products 101, by Satya Nadela, Microsoft corp.
I’m so glad my Office 2003 is not “supported” anymore by Microsoft, that I am… how to put it… dizzy with success. I don’t believe there are any people left working and Micorsoft. They have hired monkeys with Down syndrome to work on Microsoft products so they can pay them less or trick them with banana peels. Amen. And it’s cheaper as well. I deleted Microsoft Office a while ago in favor of LibreOffice 6.1.3.2 currently, which works better for me in my environment. At this point, if Microsoft were a company that actually cared about product quality, they really need to put a halt to all update releases and patches for all of their products until they can sort this problem out. @John Fenderson: I don’t believe anymore it is a problem they need to sort out, it is objective they are developing, which is to get rid of home users. They got rid of their testers, though probably not for the enterprise-oriented products. For me the M$ signal is clear: get the hell out of our products, look for alternatives. OK, message understood, action is underway.